I'd love to share more art and animation, but we're getting to the point where most new art is riddled with spoilers. Not showing new art almost makes it look like we're not moving forward, but nothing could be farther from the truth. The game is getting downright exciting. Exciting, I tell you. OK, one more... then that's it. As we play the game and do more playtests, issues start to come up. One of them we are now referring to as "The Wrench Puzzle". Don't worry, it has nothing to do with monkeys and wrenches. Only a crazy person would design a puzzle like that. Crazy, I tell you. There was a fairly long puzzle chain in Act 1 to get a wrench that unlocks a new area of the game. The puzzle had two problems. The first was the moment you realize you need the wrench to progress, you had just solved another long puzzle chain that unlocked the room where the wrench puzzle is solved. At this point, you've been built up with anticipation, then you solve the first puzzle and bam! You now have to go solve the wrench puzzle and there is no forewarning. Solving the first puzzle became a moment of disappointment rather than triumph. The second issue is that Act 1 was getting really long and the wrench puzzle was contributing to that. It's a long and complicated puzzle chain, but it's an interesting puzzle and we didn't want to lose it. So the solution we came up with was to move the whole puzzle chain from Act 1 to Act 2. You no longer need the wrench to progress which makes Act 1 smaller and the returns the moment from disappointment to triumph. It's what we in the biz call "win-win". Or maybe the younger generation calls a "double-win". But people in the know call it a "win-a-reno". We did needed to come up with a different use for the wrench, but that didn't prove to be very hard, there was a puzzle just waiting for a wrench solution. And, as an added bonus, moving the puzzle chain from Act 1 to Act 2 involved very little work. So now Act 1 is smaller and snappier and Act 2 is fuller and beefier. Wow I totally can't wait. Every time I see amazing new art like that the anticipation just grows uncontrollably! Outstanding art. I love it !!! Why do you even split the game up into different "acts". Doesn't that, in some ways, linearize an open puzzle dependency graph? I can understand not wanting your dependency graph to get TOO broad, and so I guess in a general sense it's good to have milestones within a game. Does it also serve as a story progression aspect? seems like you'd need much more than just 3 acts for that. The story is split into acts because that is how stories are told; In acts or chapters, etc. Don't think of our acts like episodes of a episodic adventure. There are many puzzle chains you can start solving and don't complete until the next (or father) act. It doesn't make the game linear at all. It's also unlike that the player will even know the act is over. Do you know when act 1 of a movie ended? Most people don't. So does this means that there would not be an explicit transition screen like in MI? Exactly. They recently announced it. I think it was one of the friday questions. Well, it's a matter of opinion, but however the game is an homage to MM which had no transition screens either. What a great art. I'm really looking forward to the game. ...while some older players might call it a pluswin (or, in really extreme cases, a doublepluswin). If I may digress for a moment, on several occasions you have mentioned that Maniac Mansion for the Commodore 64 had a cursor but no actual mouse to control it with. I just want to mention that I (or rather, my dad) had a mouse for the Commodore, and I played Maniac Mansion and Zak McKracken with it quite happily. If I recall correctly, by modern standards you had to move the mouse quite far to move the cursor, but since you never tried that yourself I can see why that is. There are mice for the C64 which can emulate a joystick. Naturally, those have a rather sluggish response characteristic. With those, it's not how far you move it, but for how long you move it which matters, just like when using a joystick. Guess you had one of those. That doesn't count as mouse support, since the game couldn't tell the difference. There are very few games with real mouse support on the C64. About the MI monkey wrench puzzle, as I played it as a kid, I wasn't fluent in english yet, so I played it in spanish. The puzzle joke doesn't make any sense because it's not called a monkey wrench in spanish. I'm not sure if there is a way out of this, because the game has to be translated to many languages, and puns will sound different in each of them and you can't make one work in all of them. But, I don't know, maybe keeping it in mind helps. Although it might be late because I guess most puzzle design is already done. Thanks Petruza, I've learned something. I played it in Italian and I always thought it was because, since Jojo is a pianist, it has strong hands. In my childish mind it made sense. The fun thing is, in Italian a monkey wrench is called a "parrot wrench", which is quite appropriate for a pirate story. Delores seems too well-lit in that scene. Or at least she seems to be lit from the wrong direction. I think there is a bug in the lighting. She looks fine if she steps back. Maybe Delores is in the lighting, not a bug. By the way: I have a serious crush on Delores. Is she available? Hey, I'd be a perfect gentleman! This is getting serious, Nor, I mean, I would never touch her. She is so... so... Boy, I can't ever find the words. Don't ever play it on a tablet! I've seen it too, but its not a big deal. I would rather like to see whats in the envelope, USE bed, LOOK AT painting, PUSH crazy machine, TALK TO moon...oh boy, slobber is running down the flews, ehm im really anticipating the release. Best art department in the known worlds! I agree, very interesting scene. I'm so glad that the usable objects don't JUMP OUT at you due to differences in lighting or shading. I always HATE THAT. I like to work for my pixels... though not too TOO much. oh mine these screenshots are just beautiful! Love the ray lights in the second one. I totally agree. Subtle, and so magnificent! Win-a-reno? I never did win anything in Reno. I did win a modest jackpot in South Lake Tahoe though: 10 times my $5 bet. But not in Reno. Oh no! I can't get enough of the artwork! I'll probably spend altogether several hours only with analyzing and enjoying the artwork, when I play the game. You should sell these images to be printed on salad packs. This art looks much better than the failure Mighty No. 9! I'm glad you solved the puzzle issues. 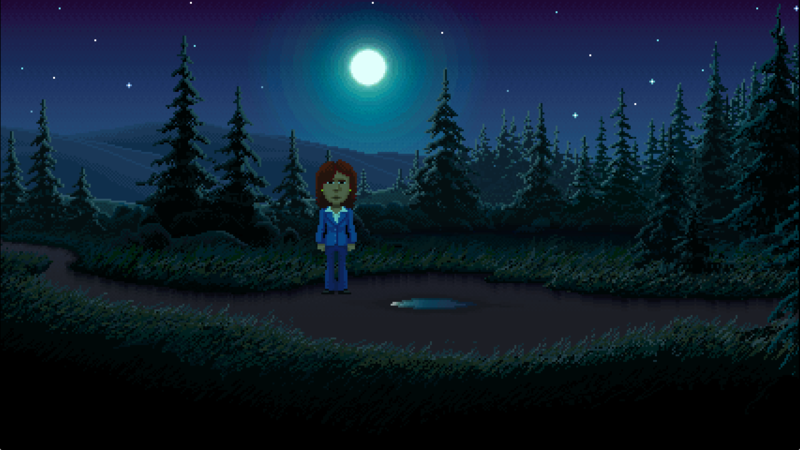 There should be more combos in Thimbleweed Park! Like when I solve two puzzles very fast after another triple points should be rewarded! And we need dashes! Ok pals, I was the one asking for new art, don't thank me too hard by the way. Look! The Thimbleweed Park sign has changed! So, puzzling up a game is a puzzle itself. I'm puzzled. The second screenshot is absolutely stunning! (Come to think of it, so is the first.) Ironically, modern games don't even come close to conveying such depth (perhaps it's just my pixely fetish deceiving me, not sure). I'm really glad you guys scratched the idea of having the game look exactly like games did in 1990. It even looks better than the way we remembered them, so kudos. It surely has been already said before, but: which resolution has been used as a base for the art? I mean, if I were to use the "pixel faithful" mode, at which resolution would the game be? 320x200? The room screens have different resolutions, so I'm not really sure. However, the resolution also depends on the aspect ratio of your display. There will be a 4:3 mode and a 16:9 mode. That doesn't answer my question, unfortunately. They must have taken a base size for drawing rooms and characters, I'm just asking which base size did they use. I'm thinking 320x200, like the old classics, but I'm not sure and I don't want to count the squares. In fact, if you zoom in to the right you notice that the last pixel column is truncated at 2/3. Let's wait and see whether there really will be a truncated column or not. Sorry, I mean vertical resolutions of 320 and 480 px respectively, in addition to the above 240 px. Ron, I have one question that has nothing to do with this post- Wheres your dog?Is it still with you? Wow! I love this blog so much for all the insight into puzzle design it provides. And then there is the beautiful art. In the beginning of this project, I was hoping that TP would be just like the old times (that I spoiled with walkthroughs at times), but the more you write here, the more I am convinced, it _will_ be just like the old great adventure games. I am starting to get excited about getting stuck in the game for the first time! Opening the door to LeChuck's castle in MI2 was such a great moment and I am looking forward to having similar experiences here. You really should post those on tumblr. They lived happily with wire-framy art in a wire-framy world with wire-framy characters. Then suddenly Mark Ferrari joined to team. It's probably mostly his fault! Fault? The game may now look like a game from the early 90s rather than one from the late 80s, but nevertheless is Mark's contribution completely faultless. It has been a piece of luck! I think, adventure game artwork has never looked more charming and atmospheric. Without him the game wouldn't look how it looks today. He is clearly the one to blame. Ron - what's the obsession with wrenches, seriously ? Any traumatic childhood memories you want to share with the group ? I have never owned or used one in my whole live , nor did I ever feel the need to posses, own or use one. Adventure games are all about doors and keys, essentially. A wrench is a key. It was never him (though his fault), it's fans (quite a lot I can imagine) reminding him often about this specific puzzle and telling about *their* traumatic childhood memories. Btw. I cannot image you've never used one, don't you have water pipes in your home? I gotta say, that second piece of background art is FAN-DAMN-TASTIC. It's exactly that kind of awesome perspective work that's been lacking in modern classic-style adventure games. Between the artwork and all of Ron's insights into puzzle design, this blog has me thoroughly convinced that this game's going to be special. Good travel to Spain, Ron! Enjoy... the weather will be clear and hot! The illuminations from the moonlight are absolutely fantastic! (and spooky lol). Setting the pace for puzzles in games is tricky and incredibly difficult to optimize. On one hand, those puzzles eventually need to be solved, but if you can give the player the freedom to do other things in the meantime while being able to think about that larger puzzle and perhaps learn and get new ideas for solutions by solving earlier, simpler puzzles, i think that works out really well. In the older Resident Evil games for example you would need to solve a huge long-winded puzzle to advance to the next main area of the game (such as having to collect 4 or 5 different emblems to insert into a wall panel thing to unlock a door to be able to leave the mansion), but you could do those in several different orders and do a bunch of other stuff in the meantime. Or in the original Shadowgate for example, very similarly there were puzzles in each room to solve, but they were so simple that solving them would kinda ease you into the type of mindset that you would need to solve the more elaborate puzzles. Although Shadowgate did have so much cryptic stuff that the devs kinda went overboard with certain puzzles, but you could still usually go to many other rooms and attempt to solve several other puzzles and find new items and spells before going back to the puzzles that the player was stuck on earlier. Yeah. I love it. Love the artwork. But I'm not quite digging the halo/rings of light around the moon. And, I wish the background and sky was a bit darker. It doesn't seem quite as creepy when you can prevalently see the mountains and the sky is nice and blue. Hmm...There won't be a day/night time cycle will there? That would be crazy. Say's ThimbleweedPark will automatically Highlight the right Verb on mouse over, allowing you to just right click the item. Not quite accurate. We'll highlight the "right" verb for obvious things like Open/Close for a door that's closed or open. But not for all objects, especially when doing so would be a spoiler. It's intended to take some of the tedium out of playing but still have you think through things. Still some tuning to do on this. 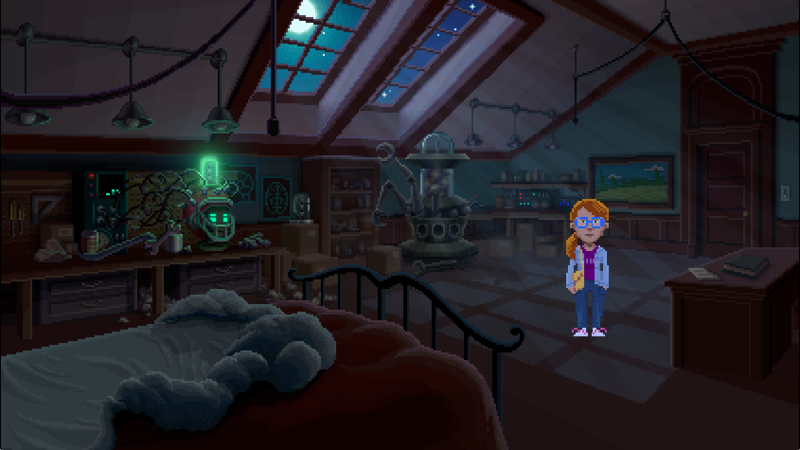 Will there be an option to disable the highlighting to get the pure Maniac Mansion feeling? I assume that even if TP was the official sequel to MM and appeared in 1990, about three years after MM, it would still have had highlighting and a graphic interface, because SCUMM got significantly improved over the years. I wonder how many variables there are in the gamre right now, to hold all the "make it an option" desires we requested! "Guess how many options there are right now in the Options page of Thimbleweed Park"
Wasn't it the same from MI on? I found very difficult to enter the argument of this puzzle without knowing what it is about, but this is not a problem: I trust ThimbleTeam, and it is better not to spoiler. 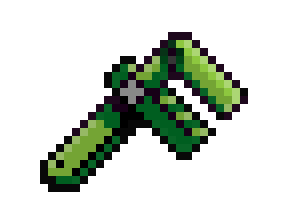 Wrenches are beautiful and useful and I think that a little part of the reason why Ron created this puzzle about a wrench is also because he wanted to show that he listened the critics he received in the monkey wrench puzzle. For those who are impressed by the fact that the images are not final art: they are beautiful, they could get a child eat tons of salad, but there'still some perspective error (the desk and the book on the top of it for example), something that someone like Mark will surely note and work on it. 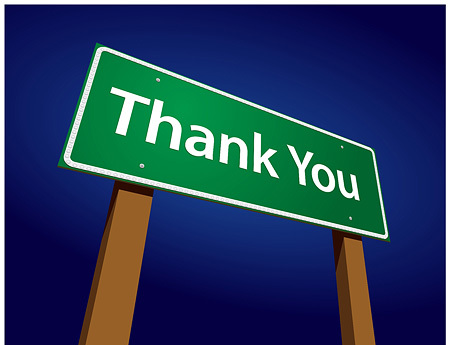 Different topic: sending my thanks to Randy Pratt, Nor Treblig, linguist, and David Fox for, back on May 22nd, putting me on the right path to completing my voice mail for the phone book! I did end up using Audacity, produced my wav file very easily, and have successfully uploaded it - beating the July 1st deadline. Your help was much appreciated. Love the unique combination of high resolution + 8 bit graphic styles! Should appeal to both current as well as retro gamers!! Magnifico. Will he speak from a height (eg sierra nevada) so we can get a glimpse with a telescope or is there a way to attend virtually? You know I don't know? Actually Ron is in Frankfurt Airoport (he tweeted a hour ago from there). So I think he will land on Barcelona in the afternoon (CEST time). I like the first screen ( and the icon). I'm afraid there is no way to get a phone book entry anymore. Or did you just miss the deadline? Then contact their support and see would they can do. Would you have jodelt the phone book entry?